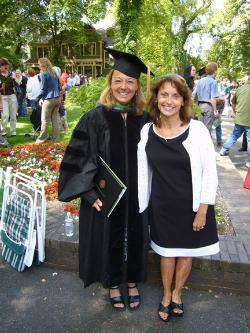 Lynn Weigand received her doctorate in Urban Studies and Planning in 2007 from Portland State University - photo with friend and fellow classmate Vicki (Hall) Thoma. Lynn was the founding director of the Initiative for Bicycle and Pedestrian Innovation at Portland State University, travelling around the world to study bicycle and pedestrian planning and design. 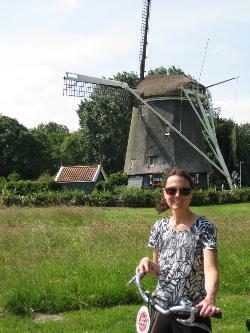 Lynn now works as an active transportation consultant, working with local and national organizations to promote walking and biking for transportation and recreation. 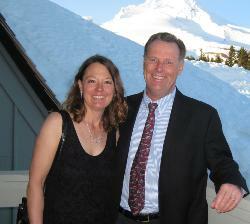 She and her husband Tod enjoy all outdoor activities, skiing on Mt. Hood and in Sun Valley, and hanging out with the neighbors in the Mt. Tabor neighborhood.